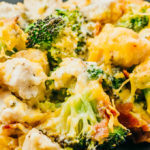 Chicken bacon ranch casserole with broccoli is a keto friendly and low carb bake. Preheat the oven to 375 F. Prepare a 9x13 inch casserole baking dish. In a mixing bowl, combine all ranch dressing ingredients and stir until smooth. Set aside. In a wide pan over medium heat, cook bacon slices for 5 to 10 minutes until crispy, turning them occasionally. Transfer to a paper towel lined plate to drain, reserving bacon grease on the pan. When cool, crumble into small pieces. Add chopped chicken to the pan with bacon grease. Saute for 5 to 10 minutes over medium to medium-high heat until cooked through, flipping and stirring frequently. Turn off the heat and set aside. While waiting for the bacon and chicken to cook, microwave the broccoli for 3-4 minutes or until tender. Directly in the baking dish: add chicken, broccoli, ranch dressing, about 2/3 of each cheese, and about 2/3 of the bacon. Stir everything until well-mixed. Top with remaining cheese and bacon. Bake at 375 F until heated through and bubbling, about 25 minutes.